In 1996 a descendant of Commodore Caracciolo accused Nelson of a war crime. This was reported in several newspapers which triggered a spate of letters to editors in the following days. Tom Pocock, eminent Nelson biographer, weighed in with the following article, published in The Times 23rd. July 1996. Mr. Pocock has managed to succinctly summarise a complex and an often misunderstood episode which we publish here to mark the bicentenary of Caracciolo’s execution. So, it seems that Lord Nelson, the most durable of British heroes, is being accused of war crimes. A newspaper reports that “historians, intellectuals and naval figures in Italy are calling upon Britain to apologise” for the hanging of an Italian admiral convicted of treason nearly two centuries ago. Commodore Francesco Caracciolo had been condemned to death as a traitor by a court of his Neapolitan brother-officers, and Nelson confirmed the sentence. Dr. Carlo Knight, a distinguished Neapolitan historian of part-British descent, has been quoted as saying that while “in England, Caracciolo may be viewed as a traitor, in Naples he is a hero”, and describing his execution as “a black spot on Nelson’s career”. The Duke of Brienza, a member of the Caracciolo family, is said to be willing to shake hands with the present Lord Nelson in reconciliation “on condition the British make the first move”. Certainly the hanging is nothing of which Nelson’s admirers can be proud, if only because much of his popularity was founded on his humanity, not least in the commuting of death sentences among his own men. Yet, as he saw it, he was justified in making a brutal and immediate example of Caracciolo. Nelson was acting on behalf of an ally, King Ferdinand IV, whose Kingdom of the Two Sicilies was vital to the British command of the Mediterranean and had been invaded by the French. A few months earlier, he had just managed to rescue the royal family from Naples before the city fell to the invaders and to an internal revolution. No matter that the Neapolitan revolutionaries – including Caracciolo as their naval commander – were led by educated aristocracy and the liberal intellectuals, who detested their boorish Bourbon king. They were allies of the hated French, and must be treated as traitors. 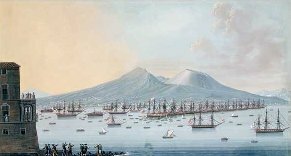 When Nelson’s squadron anchored off Naples in June 1799, the city had been retaken by the royalist counter-offensive led by a military prelate, Cardinal Ruffo. The French had withdrawn and the rebels had taken refuge in the city’s three great castles, but had emerged to trust in an amnesty offered by Ruffo. However, as Nelson saw it, this amnesty could be authorised only by King Ferdinand, and he declared it invalid. So the revolutionaries were handed over to royalist courts, and a horrific series of executions began. Caracciolo met a mercifully swift end, spared the horrors of being hanged before jeering crowds while the executioner clowned, sitting astride his victim’s shoulders. He was tried by a court of royalist officers, sentenced and hanged from the yard-arm of his own ship. Under the tensions of the time, it is unlikely that Nelson would have commuted the sentence even if he himself had not been in a disturbed state of mind. At the Battle of The Nile a year before, he had suffered a head wound which, it has been suggested, might have brought on temporary behavioural changes, perhaps shortening the temper and loosening the inhibitions, symptoms such as may be caused by head injuries in road accidents. He was in conflict with with his own superior, Lord Keith, refusing orders to leave Italian waters for Minorca, declaring, “I have no scruple in deciding that it is better to save the Kingdom of Naples and risk Minorca, rather than to risk the Kingdom of Naples and to save Minorca”. He was suffering from guilt over his affair with Lady Hamilton and his betrayal of his wife. Late nights in Palermo while Emma gambled, champagne and unaccustomed rich food had made him even more tired and probably liverish. Add to this the first -hand stories he had heard of atrocities by the French revolutionaries, with whom he bracketed even the most idealistic and mild of sympathisers. In short, he was bloody-minded. War is always brutal and seems even more savage when seen with hindsight in peacetime. The Napoleonic wars were less gratuitously brutal than some, but the hanging of Caracciolo should be seen beside General Bonaparte’s execution of several thousand Turkish prisoners of war at Jaffa in the same year. Commodore Caracciolo is seen as a hero by some and a traitor by others; it was his misfortune that his path crossed Nelson’s at a time when the latter was displaying uncharacteristic ruthlessness in carrying out the cruel customs of war.